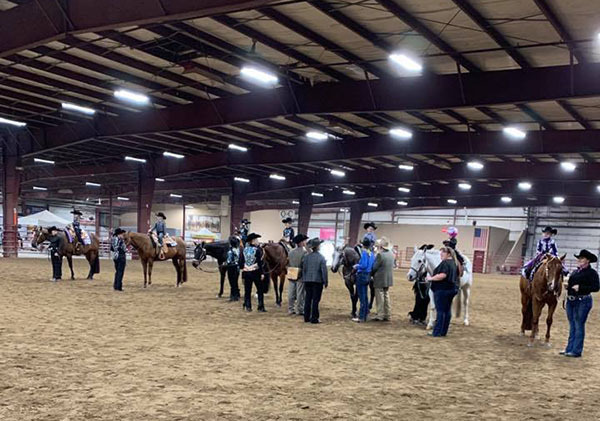 AQHA enthusiasts braved chilly temperatures in Cloverdale, Indiana, January 24-27 for four days of showing with six judges officiating at the C Bar C Winner Circuit. The judges’ pool for the show was Jim Searles, Jeffrey Pait, Chris Thompson, Holly Hover, Mark Russell, Tom McBeath, Jeff Buck, Bruce Brown, and Lynda Danielson. Congratulations to High Point winners at the show like Small Fry Champion Brooklyn Donaldson with Sonnys Sweet Sierra. Kathy Curry and Hot Prada were the L1 Amateur Walk-Trot Champions. Haley Henry and Oh Lord Shes A Ford won the L1 Youth Walk Trot division. The L1 Amateur Champion was Katie Pidgeon with Sure Enough Lazy. The Amateur High Point Champion was Andrea Betnter with KM No Doubt Im Best. The Select Champion was Tammy Dewey with Rios Marecedes. Winning the L1 Youth division was Justin Gregg with Lopin By My Dreams. Winning 13 and Under was Nichole Pezan with Soo Sophisticated. The 14-18 Champion was Tori Kendle with Quita Machine. The Open High Point Champion was Sleepy N I Know It with Briley Czerwinski. Click here to view results from S/C 1. Click here to view results from S/C 2.